(The Indian Express,; September 24, 2016). An honest teacher all his life, is not able to comprehend the rationale behind the recent order by the state education ministry asking every secondary and senior secondary school to purchase collected works of Deendayal Upadhyay. The circular sent by the state government on 27 th February has asked all secondary and senior secondary schools to buy the compendium of essays and speeches titled ‘Deendayal Upadhyay Sampoorna Vangmay‘ – which has been published by a Delhi publisher in 15 volumes at a concessional rate of Rs 4,000. Schools are asked to draw from the school development fund – meant to be utilised for local needs – to make the purchase. The compendium has been edited by Mahesh Chandra Sharma – former state BJP president – which was released by PM Modi in October last year. Where can one keep all these 15 volumes and how their purchase can benefit ordinary students – who lack good quality text books – he asks himself but does not get satisfactory answer. Definiely, as a Principal of a secondary school Rajaram is not alone who finds himself in such a quandary. There are scores like him spread across the state who have similar questions before them . It need be added that this is not for the first time that state government has ordered/instructed schools to order a particular book which is not at all related to their course . It was only last year that Rajasthan government was in the news when it was reported that a biography of RSS founder-member Dr Hedgewar – written by Rakesh Sinha – should be purchased by every government school. First, asking to buy Hedgewar’s biography and now instructing to buy collected works of a RSS ideologue, it is becoming increasingly clear that the state education ministry is not concerned about the growing criticism of the status of education in state but more keen to push what Congress has called ‘saffron agenda’ in schools. Close on the heels of the order to schools to buy Deendayal’s works came another news – credited to the education minister himself that he has changed the name of Akbar Fort in Ajmer to Ajmer fort. His alleged remarks about Emperor Akbar also created controversy. And the biggest problem with all such orders and the debate or the controversy they generate is that the status of education in the state never gets discussed which suffers not only from lack of sufficient funds, good quality teachers and satisfactory infrastructural facilities in all schools but also is inundated with textbooks which as an expert committee said suffer from ‘limitations of content’ and implicit biases. “Only about 45% of students of Class Three in the state could actually read words while 20% of those in Class Two were unable to recognise letters, according to the latest Annual Status of Education Report [http://img.asercentre.org/docs/Publications/ASER%20Reports/ASER%202014/fullaser2014mainreport_1.pdf ] published in 2014.” and over the years the reading and comprehension ability of primary students has actually decreased. Around two years back the state government’s move for Public Private Partnership (PPP) in School Education had also come under scanner from members of civil society and educationists. The open letter issued by them had not only exposed status of education in the state and questioned the way government wanted to ameliorate the situation. It pointed out ‘extremely low levels of investment in the public education system in the state and expenditure made by the state government in elementary level of education which was above 3 % of Gross State Domestic Product and per-student expenditure by the government was much less in Rajasthan than in other states’ and how the state ‘has the highest number (in absolute numbers) of out-of-school-children in India and ranks 4th among the Indian states with respect to child labour and as per the recent Socio Economic and Caste Census, 2011, Rajasthan has the highest number of illiterates in the country and also its transition rate in secondary education is likewise below the national average. (http://www.epw.in/journal/2015/29/reports-states-web-exclusives/misguided-education-policy-rajasthan.html#sthash.LVsN35yQ.dpuf). This move to go in for PPP in education was later rescinded by the government when it faced resistance from more than 3.5 lakh teachers and also it feared a political backlash. In such a milieu where Jawaharlal Nehru hardly finds mention or or Nizamuddin Auliya is described as a great saint ‘despite being a Muslim’ it does not appear surprising that Deendayal Upadhyaya is introduced before the impressionable minds with a bang. 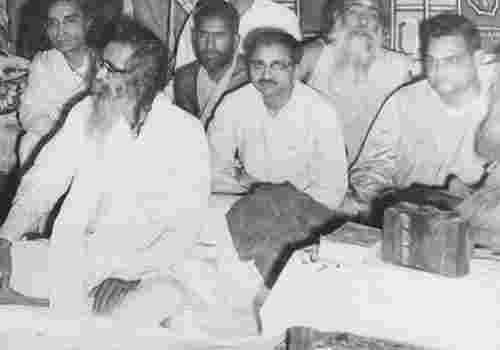 Deendayal Upadhyay is credited with starting a monthly Rashtra Dharma from Lucknow in the 1940s for spreading the ideology of Hindutva nationalism. Later he started a weekly Panchjanya and a daily Swadesh. He later became one of the most important leaders – its theoretician and ideologue as well – of Bharatiya Jana Sangh, the forerunner of the present day Bharatiya Janata Party. The Jana Sangh adopted “Integral Humanism” as its “guiding ideology” in 1965 which was also adopted by the BJP in 1980. His death at Mugharsarai station still remains a mystery with one of his colleagues ( Balraj Madhok) in his autobiography even pointing fingers towards few key leaders of the Parivar itself. Anybody can see that the manner in which Deendayal Upadhaya looks at Muslims as ‘problem’ has deep resonance with the worldview of Golwalkar – the second supremo of RSS who has described Muslims as Internal Threat no 1 in his book ‘Bunch of Thoughts’ or his ideas about freedom struggle, or Hindus as basis of nationhood are no different from Golwalkar’s worldview. ““Deendayal Upadhyaya supplements Golwalkar’s cultural nationalism with his theory of integral humanism (Ekatma Manavavad). This new theory adds some sophistication to the RSS concept of Hindu Rashtra and enriches its ideological underpinnings” (RSS’ Tryst with Politics; Manohar, page 118). A year and half back a special issue of ‘Rashtra Dharma’ a journal which was started by Deendayal Upadhyay -former PM Atal Bihari Vajpyaee had also served as its joint editor once – was released by Union Minister Kalraj Mishra in Lucknow. This special issue of the monthly carried articles about him and his views. As we write these lines one can very well surmise that there would be many schools in Rajasthan who would be busy implementing the latest circular mentioned above by the education ministry or few might have put their orders for the delivery of the compendium from the Delhi publisher. And principal Rajaram’s ( name changed) query about the proposed purchase that how can it benefit ordinary students – who even lack good quality text books, must have remained unanswered still.